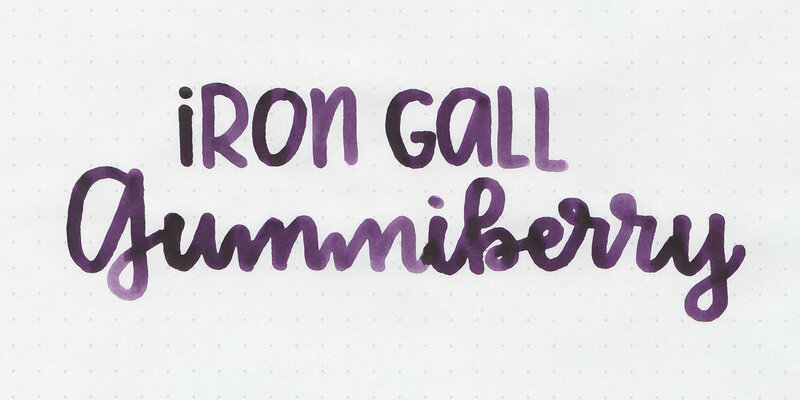 We are kicking off KWZ week (where we do seven days of KWZ ink reviews) with a review of KWZ Iron Gall Gummiberry. Thanks to inkjournal.com for sending a sample over for review. Iron Gall Gummiberry is a dark, saturated purple. When pooled, this ink turns a dark purple, almost black. Water resistance: Medium-some of the ink washed away but the writing was still readable. Ink swabs for comparison, left to right (top to bottom for mobile RSS): KWZ (non-IG) Gummiberry, KWZ Iron Gall Gummiberry, and KWZ Brown Pink. Click here to see the KWZ inks together. Birmingham Pens Lilac Wind, Robert Oster Dark Chocolate, and Birmingham Pens Eggplant Parmesan. Click here to see the purple inks together. I used a broad Pelikan M805 Ocean Swirl on Tomoe River paper. The ink had a lovely wet flow. Overall, I like the flow of this ink, and it's a great color. Give it a try, you might love it. Disclaimer: A sample of this ink was sent to me by inkjournal.com for the purpose of this review. All photos and opinions are my own. There are no affiliate links on this page.